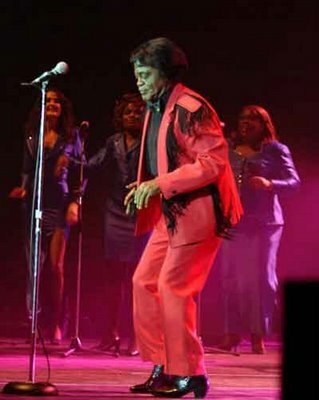 James Brown, dead at the Apollo. Quite literally, with thousands lined up to see him-- I would have gone too if I hadn't been on a train back to NYC tonight. Anyone who has followed this blog for a while knows the man was truly an inspiration to me. I still can't believe it-- I only just found out this afternoon that he died this past Monday. I had actually thought I'd try to get tickets to see him this New Year's Eve, but I guess God called him to "get up offa that thing," meaning our mortal world. He gave it up and turned it loose. And hey, the man was all soul already. But no matter what, the Godfather of Soul will live on, in his music and here at this blog! Mr. Brown was born May 3, 1933, in a one-room shack in Barnwell, S.C.
As a boy he earned pennies buck-dancing for soldiers; he also picked cotton and shined shoes. He was dismissed from school because his clothes were too ragged. He was imprisoned for petty theft in 1949 after breaking into a car, and paroled three years later. He was a stern taskmaster who fined his band members for missed notes or imperfect shoeshines. He was an entrepreneur who, at the end of the 1960s, owned his own publishing company, three radio stations and a Learjet (which he would later sell to pay back taxes). And he performed constantly: as many as 51 weeks a year in his prime. During the 1970s the Internal Revenue Service demanded $4.5 million in unpaid taxes; the jet and radio stations were sold. In 1999, Mr. Brown made a deal to receive more than $25 million in bonds against advance publishing royalties. This year, however, he sought to refinance the bonds with a new loan. The banker who had made the original deal, David Pullman, objected to the terms, and Mr. Brown filed a lawsuit against him in July. One piece of info that I tried to find was some estimate of how much money he made on royalties from the use of samples of his music by various hip hop artists-- I remember hearing somewhere that he made more on that than he ever did on album sales, but I'm not sure if that is true. Now that, to me, has to be the best financial advice ever. Don't rest in peace, Godfather-- keep makin' it funky! What a wonderful tribute. Thank you for sharing. You are the first blog I saw to post of this huge loss. refined the harvesting and manufacturing of perfumery processes to include other aromatic ingredients. Thus, the ancient Islamic culture marked the history of modern perfumery with the introduction of spices and herbs. outside of their indigenous Asia. We'll miss you, James Brown! Thanks for the post! I'm not one for dancing in public, but one day many years ago the soul hit me and every time I hear the first notes of one of his songs something washes over me and I get this little shoulder thing going and if I was in a bad mood, it disappears! For some reason whenever I sit in a certain restaurant in a certain casino they play one of his songs. I'm as white as they come and there have been a few times a table full of older black people stared at me the whole time I did my little jig, perhaps thinking I was making fun of their color? I didn't care, because there were other times they caught the soul too, overlooked my weird chair dancing, nay, were perhaps empowered by it, and began to sing along and dance in their chair; and we bonded, if only for a few minutes, strangers in a room, by the power of the Godfather himself!